Connor Girard is unbeaten in playoff games in his Edina career, winning 10 straight including a Class AA quarterfinal victory Thursday afternoon (Photo by Helen Nelson). Connor Girard admitted he didn’t know who was at the other end of the hot shots he was stopping. The Edina goaltender shrugged when he was asked how he felt about repeatedly robbing Blaine's Mr. Hockey finalist Jonny Brodzinski. Whether it was by design or by ignorance, it worked. Girard casually dismissed any nerves that might have cropped up just as he casually turned aside shot after shot by Blaine – and, particularly, by Brodzinski. 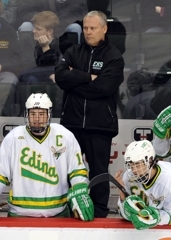 “He’s not paid to think, he’s paid to stop the puck,” joked Edina coach Curt Giles. It’s been a good investment for the Hornets. After making 17 saves in a 3-2 victory over Blaine in the Class 2A quarterfinals Thursday morning at the Xcel Energy Center in St. Paul, Girard is now a perfect 10-0-0 in playoff games since he took over full-time goaltending duties late last winter. He backstopped the Hornets to a state title as a junior – and now has them two victories away from a repeat. “I just try to take away as much of the net as possible and challenge them,” Girard summed up his strategy in big games. Jake Sampson and Andy Jordahl scored goals 2:13 apart early in the second period to erase a 2-1 deficit and send the Hornets (19-7-2) into the semifinals Friday night against the winner of the Duluth East-White Bear Lake semifinal. Blaine (20-5-4) had led after one period on two special teams goals -- a power play blast from the point by Michael Brodzinski and a short-handed snipe by Jonny Brodzinski. Nick Malvin was also impressive in the Blaine net, with 24 saves on 27 shots. But Thursday afternoon, it was Girard’s show. With Edina clinging to a one-goal lead in the third period, Girard was at his best – largely at the expense of Brodzinski, who had five third-period shots and a game-high nine in total. Still, Girard wasn’t taking numbers when he was making saves. He stymied the Bengals’ top goal-scorer on numerous chances, including a 2-on-1 midway through the third that had the crowd oohing and aahing. Taking in a pass from Jesse Norling, Brodzinski ripped a one-timer that appeared headed for the back of the net. But Girard flashed his leg out, kicking the shot away. Girard has had more than one opponent shaking his head in disbelief during the playoffs the last two years. He’s been exactly what the Hornets have needed in net, a calm and unfazed presence between the pipes. At times, it seems as if Girard doesn’t realize he’s not supposed to stop every puck. Edina's Max Everson is playing with a splint on his injured wrist (Photo by Helen Nelson). It was the injury heard ‘round the state. With the final seconds ticking off the game clock during the Thursday, Feb. 10, matchup against Minnetonka, Edina defenseman Max Everson was checked awkwardly into the boards of Pagel Activity Center while centering the puck. Though Everson’s pass set up an empty goal that would seal the Hornets’ victory over Minnetonka and the Skippers’ first home loss since January 10, 2009, the cost was difficult to bear. Everson was forced to finish the game with a trip to the emergency room after leaving with a wrist injury. “When I first saw it, I thought I was done just by the way it looked,” Everson said. The rest of the Hornets quickly realized the severity of the injury. Edina’s depression quickly turned into joy. “It ended up the next day that I got that surgery on it and the doctor told me I’d be able to go in a couple weeks if I felt good enough,” Everson said. “So that made me happy. I didn’t know exactly what level I’d be playing at but I got to come back in the semifinals during sections. The decision to return may have left some scratching their heads as Everson had verbally committed to Harvard University a month prior to his injury. Did the Hornets’ senior co-captain have any second thoughts? With the injury to coming to Everson’s left wrist -- his bottom hand -- extra precautions had to be taken besides a successful surgery. The splint may be working well, but Everson admits he is still not completely at 100 percent. 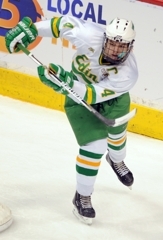 That limitation didn’t stop Edina’s top defenseman from taking a slap shot -- one of his first in game action since the injury -- during the Hornets’ 3-2 victory over Blaine in the Class 2A quarterfinal. Previously during section playoffs, Everson had either opted to send a wrist shot on net or pass instead taking a hard slap shot. “I don’t think anything was going through my head -- I think that’s why I took it,” Everson said. “It was a perfect opportunity and I’ve been working towards that way. I got a week off after sections which helped. 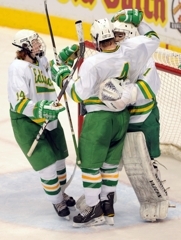 That's good news for Edina, as Everson has several years of state tournament experience which has transitioned to leadership for the Hornets’ underclassmen. 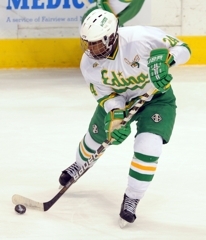 “Just play your game, it’s simple,” Everson said of his advice to Edina’s younger skaters. “It’s the same size ice sheet as we play on all year so it’s the same game. There’s more people up there but you just gotta take that and use it as excitement not get nervous because of it. You just gotta channel your emotions the right way. Despite his heavy experience, Everson noted that playing in the state tournament never loses its glamour. “If anything it just gets better and better,” Everson said. “When you know what to expect, you know it’s such a great thing. The excitement when you’re coming up to it -- like the days before this, I couldn’t even sleep because I was so excited. The senior forward and Mr. Hockey finalist had nine of the Bengals shots, and most times he put them in places that would result in goals. Not against Girard. Brodzinski did score late in the first period to put the Bengals ahead 2-1. The Hornets senior defenseman took a slap shot – a slap shot! – despite his broken left wrist. The shot led to a goal by Michael Sit. Every time Everson had the puck, which was most every shift, he seemed to make the perfect decision with the pass. The Harvard recruit and Mr. Hockey finalist also finished with a team-high five hits, including a few that rattled the Xcel Energy Center boards and Plexiglass. 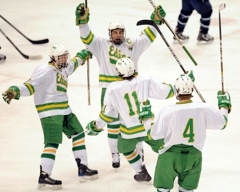 New season, new players in the lineup, same result for Edina’s boys’ hockey team. Thursday’s 3-2 victory against Blaine in the Class 2A state tournament quarterfinals echoed the Hornets’ title run one year ago. Three different lines scored a goal, the defensemen limited chances and goaltender Connor Girard made key saves. No. 2 seed Edina went ahead 1-0 as Michael Sit and the first line struck for a first-period goal. 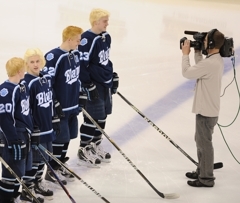 Then Blaine, its players sporting matching bleach-blond hairdos, made its mark with two special teams goals. Sophomore defenseman Michael Brodzinski scored on the power play, and older brother Jonny added a shorthanded goal. 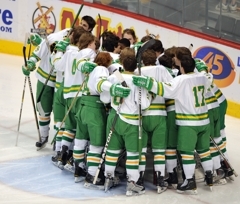 Trailing 2-1 at the first intermission, Edina players heard from Giles in the locker room. Sampson punched in a loose puck at 2:09 of the second period during a scramble near the Blaine goal. And Andy Jordahl, a fourth-line center, flipped a backhand shot over Blaine goaltender Nick Malvin’s glove at 4:22.